VIENNA — Iran took a hard line Thursday on two of the biggest demands of world powers in a final nuclear accord, rejecting any extraordinary inspection rules and threatening to ramp up enrichment of bomb-making material if the United States and other countries re-impose sanctions after the deal is in place. Speaking to reporters in Vienna, where diplomats are trying to clinch a comprehensive nuclear pact, a senior Iranian negotiator said the U.N. nuclear agency’s standard rules governing access to government information, sites of interest and scientists should be sufficient to ensure that Iran’s program is solely for peaceful purposes. Anything beyond that, he said, would be unfair. The U.S. and other negotiating countries want Iran to go further. “We should be realistic,” said the Iranian official, who briefed members of the news media on condition he not be quoted by name. He also questioned the legitimacy of countries that don’t accept the International Atomic Energy Agency’s jurisdiction demanding that Iran be subject to tougher requirements than any other nation. The official was making a clear reference to Israel, a state widely presumed to maintain an undeclared nuclear arsenal. But the marker will be a cause of concern for the Obama administration and its negotiating partners, who are hoping to forge an agreement that would curb Iran’s atomic program for a decade in exchange for relief from crippling sanctions. Iran has committed to implementing the IAEA’s “additional protocol” for inspections and monitoring as part of an accord. The protocol would give the IAEA expanded access to declared and undeclared nuclear sites, and to the sensitive information of the more than 120 governments that accept its provisions. But the rules don’t guarantee monitors can enter any site they want to and offer no specific guidance about sensitive military sites — an issue of particular interest with Iran, given the long-standing allegations of secret nuclear weapons work at its Parchin base near Tehran. Instead, the IAEA’s regulations allow governments to challenge such requests and offer alternative proposals for resolving concerns, such as providing additional documents or access to nearby locations. And for that reason, U.S. officials have regularly stressed that rules for inspections in an agreement with Iran would have to go beyond those laid out by the IAEA, including even a “dispute resolution process” to force Iran to open up facilities, if necessary. Even as Iran’s supreme leader, Ayatollah Ali Khamenei, has defiantly rejected such access, U.S. official have sought to differentiate between what Iranian officials were saying for domestic consumption and what they were promising in the negotiating room. Tehran says its program is solely for peaceful energy, medical and research purposes, but wants a deal to level the mountain of sanctions that have crippled its economy. President Barack Obama, hoping to calm those who oppose the deal because they don’t trust Iran to hold up its end, has said the U.S. would maintain the ability to snap sanctions back into place if Iran cheats. But the Iranian official said that ability goes two ways. The official didn’t spell out what that meant, but Iran would have several options, such as installing new centrifuges, enriching uranium at levels closer to weapons-grade or restarting activity with material that can be used in warheads where it has pledged to do no such thing. If the deal is good, however, the official said the Islamic Republic would have no need to revert back to its previous capacities. There were few public signs of progress as the high-level negotiations entered a sixth day Thursday after diplomats blew through a June 30 deadline and extended an interim accord by a week. Work was progressing, albeit slowly, officials said. “Not at breakthrough moment yet,” British Foreign Secretary Philip Hammond tweeted. Hammond had a morning meeting with U.S. Secretary of State John Kerry, who also consulted top diplomats from China, France, Germany and the European Union. 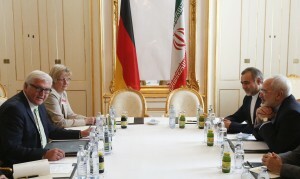 Kerry met Iranian Foreign Minister Mohammad Javad Zarif late Thursday. Speaking at the Vienna-based Organization for Security and Cooperation in Europe, German Foreign Minister Frank-Walter Steinmeier said all participants had “the serious intention to finalize a deal,” but cited numerous unresolved issues. “The last steps are the most difficult ones,” he told reporters. Negotiators have given themselves until at least July 7 to reach agreement.